Thank you for your interest in SOHNCO Landscape. First and Foremost, we are a family-owned and managed company, where I work face-to-face with clients and oversee every aspect of the company, on the field and in our friendly office. In January 2017, my wife and I purchased SOHNCO Landscape from my in-laws. They started SOHNCO 40 years ago, my father-in-law pushing a lawn mower and my mother-in-law handling all the office work. 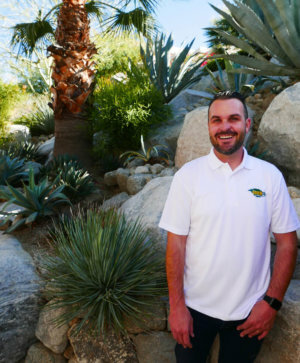 They built a reputation in the Coachella Valley for high-caliber work, innovative designs and dedicated employees. Today, I am grateful for their hard work and strive to provide the same level of service they¹ve offered to clients for four decades. I’ve learned the industry from my father-in-law as well as taking several training courses to help fill the gaps. Coming from a sales background, I find it most important to have happy clients and employees. And will do everything in my power to make sure at the end of the day, clients see exactly what they want in their outdoor living space. Our first year was filled with success and challenges and we now look forward with excitement and more knowledge. Thank you for choosing SOHNCO. We look forward to working with you soon.